The Sea Venom was the navalised version of the Venom NF.2 two-seat night fighter, and was used as an all-weather interceptor by the FAA. The necessary modifications for use on the Royal Navy's aircraft carriers included folding wings, a tailhook (which retracted into a characteristic "lip" over the jetpipe) and strengthened, long-stroke undercarriage. The canopy was modified to allow ejection from underwater. The first prototype made its first flight in 1951, and began carrier trials that same year. A further two prototypes were built. The first production Sea Venom took the designation FAW.20 (Fighter, All-Weather). It was powered by a single de Havilland Ghost 103 turbojet engine and its armament was the same as the RAF version. 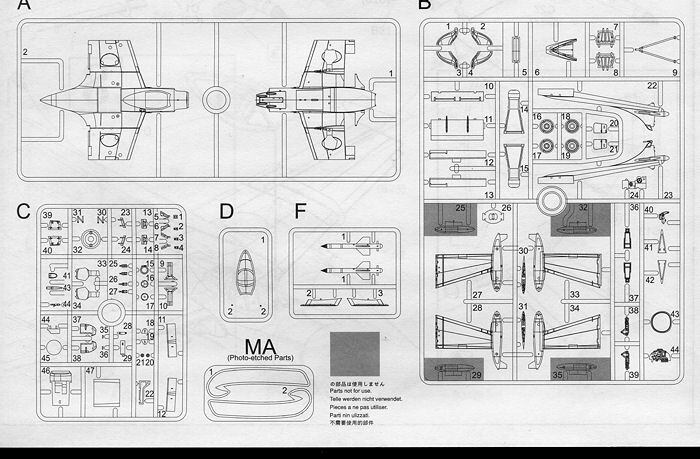 The next variant was the FAW.21, which included the modifications introduced in the Venom NF.2A and NF.3. Some of these modifications included the Ghost 104 engine, a clear-view canopy and American radar. The final Royal Navy variant was the FAW.22 powered by the Ghost 105 engine. A total of 39 of this type were built in 1957–58. Some were later fitted out with the de Havilland Firestreak air-to-air missile. This missile was originally named Blue Jay, but was renamed. A modernized Sea Venom project, the DH.116 with swept wings and upgraded radar was considered, but cancelled as the Royal Navy believed that any replacement needed two engines. The de Havilland Sea Vixen ultimately replaced the Sea Venom. Nice to see that Cyber-hobby has released another Sea Venom after the very nice Sea Vixen produced just a short time ago. This aircraft was what the Sea Vixen replaced so having it available to us is quite nice, especially as the only other injected kit done in 1/72 was the very old and rather basic Frog kit. I believe that perhaps CMR has done a resin kit of this, but am not positive. After having reviewed so many Cyberhobby kits for you, I hope you realize that the detailing is superb and that there are quite a few options available. This one has a complete engine system from intakes to exhaust that one will be building if one wishes. Now there is an upper fuselage hatch that can be left off to show the engine, but some may wish to close that hatch and leave off some of those bits not needed. One benefit of the latter is that it will need a bit less in the way of nose weight. Fortunately, there is lots of room and one can attach the nose last to ensure one has sufficient weight. Other options are for deployed flaps and while the rudders and elevator are separate, I do believe that these are molded for the neutral position. There is a nicely done interior that I am sure will generate some aftermarket. I am not sure if the seats are too short as was the case with the Sea Vixen, but since the cockpit is black, most of us will be satisfied with what is provided. Instruments are provided as decals. The cockpit is topped with a one-piece canopy. The two nose radar access panels are separate, though there is really nothing to see behind them. As with the Sea Vixen, one can do the wings folded. The wings have a separate ailerons as well. The lone use for photo etch is for the wing fences. To me, this is an excellent use of this material as these fences were quite thin. A pair of small fuel tanks can be used under the wings. As you might expect, the only real difference in plastic between this kit and the initial boxing are the missiles. The drop tanks are still provided on the base sprues. Instructions are typical of Cyber-hobby and well drawn. Actual construction will show if any parts are mislabeled as sometimes happens. As is now the norm, color information is provided in both Gunze and Model Master paint lines. 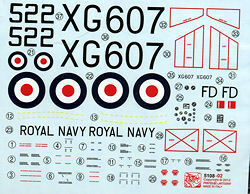 There are markings for a single aircraft based at RNAS Ford. From what I can gather, no fleet Sea Venom squadron operated with the Firestreak, the Ford marked plane being with a test unit, as is somewhat verified by the blue color of the missiles. No other information is provided. Camouflage is the standard of the time; Extra Dark Sea Grey over White. As a note, the EDSG quickly fades to just Dark Sea Grey upon exposure to the elements. The sheet is well printed and includes a full stencil suite. Those who have an affinity for the FAA will be very pleased with this kit. It adds something a bit different from the other FAA aircraft of the time . Thanks to www.dragonmodelsusa.com for the preview kit. This one should be on your dealer's shelves so go grab one.